Presented by Dr. Zahra Maleki and Dr. Derek B. Allison and prepared by Dr. Mark Hopkins. 68 year old woman with paralaryngeal mass and an enlarged supraclavicular lymph node. 68 year old woman with paralaryngeal mass and lymphadenopathy. 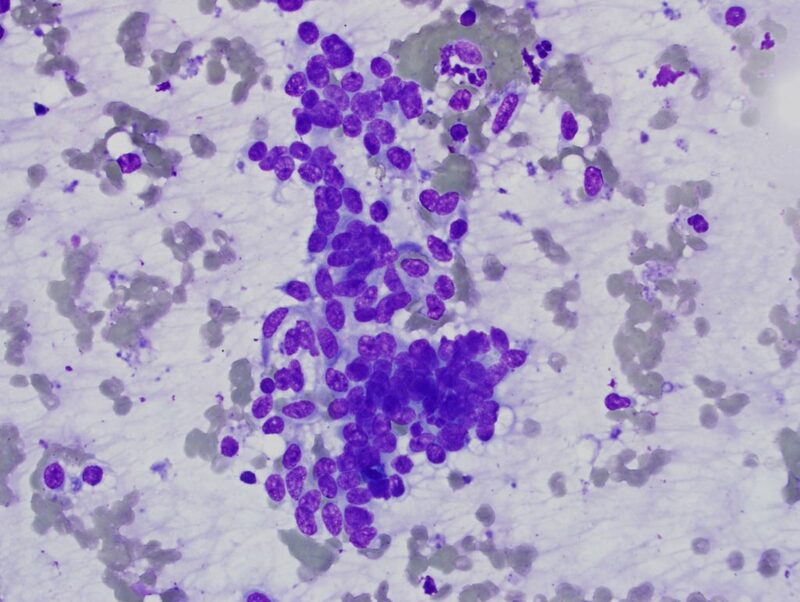 FNA of the enlarged supraclavicular lymph node was performed. What is the most likely diagnosis? 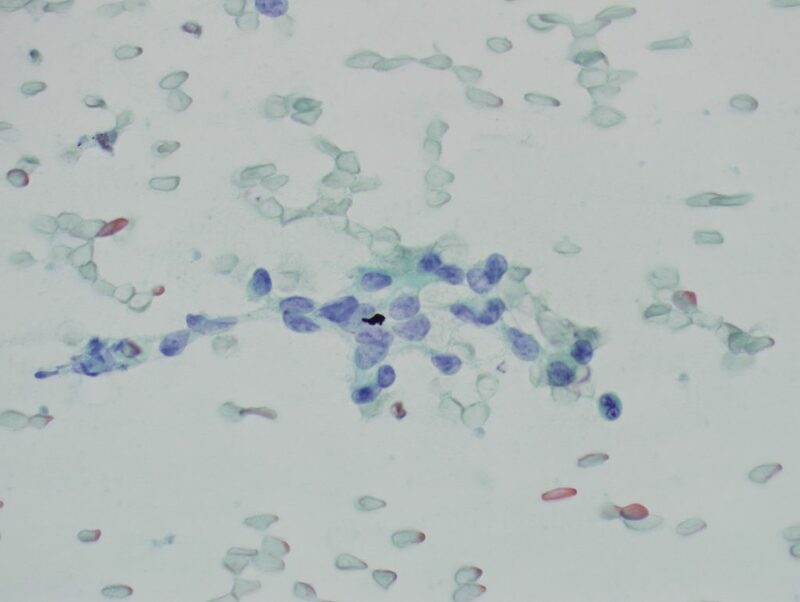 Microscopic descriptions: Cytology preparations demonstrate a cellular specimen containing loosely cohesive oval epithelioid cells as well as spindle cells. There are areas mimicking pseudo-glandular formation. Nuclear pleomorphism is present. The nuclei are enlarged with coarse chromatin. The cytoplasm is scant to moderate. The core biopsy demonstrates a relatively uniform population of spindle cells with a fasicular to storiform architecture. Many of these cells demonstrate elongated nuclei with eosinophilic cytoplasm. The cellularity is variable, with both densely cellular and more paucicellular areas apparent. Prominent bands of collagen can be seen in less cellular regions. Rarely, polygonal cells with eosinophilic cytoplasm can be seen. 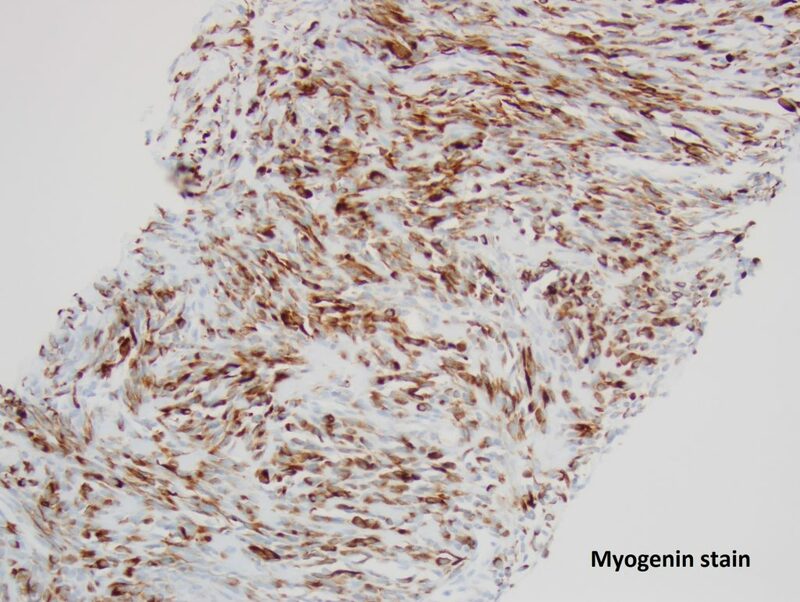 Immunohistochemistry shows strong, diffuse staining for smooth muscle actin, desmin, and myogenin. Keratin is negative. Differential diagnosis: In adults, rhabdomyosarcoma tend to arise in the head and neck. In children, they are commonly seen in the paratesticular region. The differential diagnosis will vary based on clinical context. 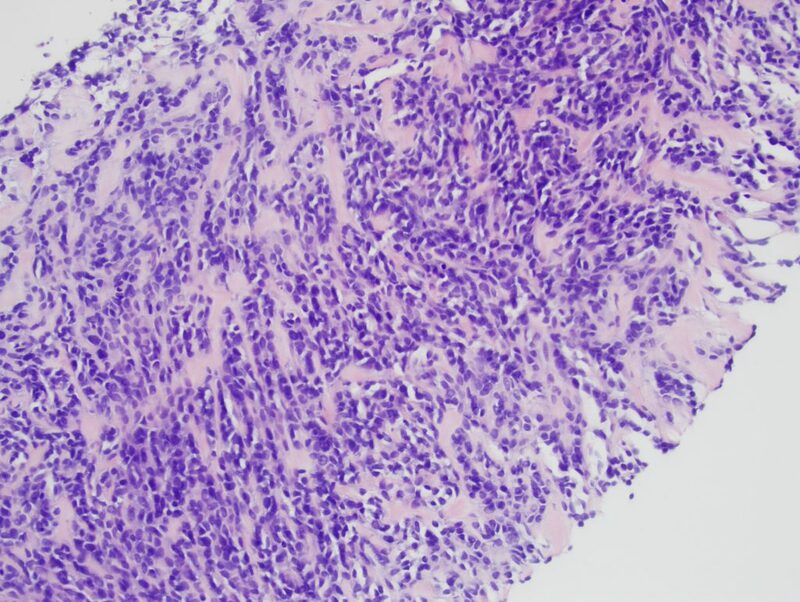 Given the cytologic and architectural overlap with smooth muscle tumors, the leading differential diagnosis is a leiomyosarcoma, especially in the context of a likely metastasis. However, myogenin positivity makes this less likely. A monophasic synovial sarcoma could also be considered based on morphology, and would be positive for TLE1 and keratin but negative for markers of smooth muscle differentiation and myogenin. A malignant peripheral nerve sheath tumor may have similar histology, and in some tumors will demonstrate rhabdomyoblasts (Malignant triton tumor). Many of these tumors will have focal S100 positivity, and generally will not have diffuse expression of smooth muscle markers.